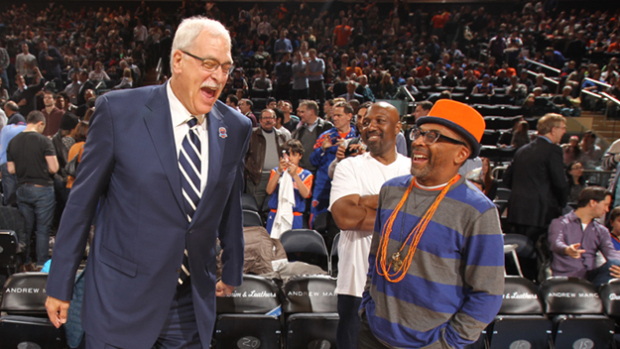 Earlier this week, we reported that Phil Jackson, who won 11 NBA championships as a coach with the Lakers and Bulls and 2 as a player with the Knicks, was leaning towards accepting James Dolan’s offer to become the Knicks’ President of Basketball Operations. Now, reports are leaking that the two sides have agreed in principle to a deal that would make Jackson the highest-paid executive in NBA history, and possibly net The Zen Master a minority ownership stake in the team. The details should become more clear in the coming days, but as things stand, it appears that Dolan has gotten his man. This entry was posted in Articles and tagged James Dolan, KNICKS, knicks blog, knicks coach, knicks fans, knicks gm, Knicks Hire Phil Jackson, KNICKS MEMES, Knicks news, knicks president, knicks rumors, new york knicks, phil jackson, phil jackson james dolan, phil jackson knicks, phil jackson knicks coach, Phil Jackson Knicks Position, Phil Jackson Knicks President, Phil Jackson Knicks Title, Phil Jackson Owner, Tommy Rothman, tommy rothman knicks on March 12, 2014 by Tommy Rothman.